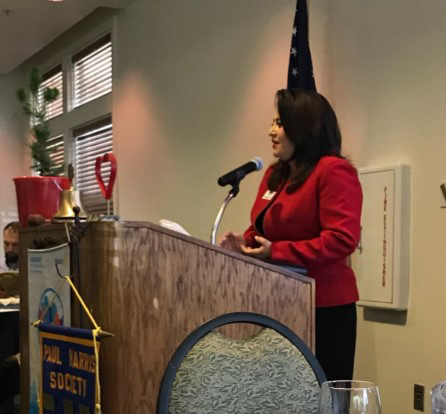 At the April 9, 2018 meeting, the Rotary Club of Sierra Vista heard from the President and CEO of the Tucson Hispanic Chamber of Commerce and welcomed two new members to the club. The speaker for the meeting was Ms. Lea Marquez Peterson, President and CEO of the Tucson Hispanic Chamber of Commerce. The Hispanic Chamber of Commerce was founded in 1989 with the mission to "advocate for and provide services that help grow member’s businesses in the bilingual and bicultural region" of Southern Arizona and Northern Mexico. In advancing that mission, the Chamber has been honoring Hispanic Business Women and Man of the Year for 20+ years, at gala events held at the Casino del Sol. In 2009, Ms. Marquez Peterson, a small business owner and an involved community leader, stepped into the leadership role of the Chamber and helped spur rapid growth of the organization to around 1800 members. By focusing on the Hispanic purchasing power of nearly $40 billion and delivering value in services to its members, the Chamber has become the largest chamber in Southern Arizona. The services provided help identify untapped business opportunities in government procurement, international trade, and business education, while the Chamber assists in research issues with an Hispanic Market Outreach program. As a measure of the importance of the Hispanic purchasing power, Ms. Marquez Peterson noted that the regional population in Arizona is currently 35% Hispanic and that it is expected to be greater than 50% by 2030. The Tucson Hispanic Chamber of Commerce was named the 2013 National Hispanic Chamber of the Year and for the last nine years, the Chamber has been building "seats at the table" while engaging in advocacy for Hispanic issues. The Chamber linked to the Arizona Chamber of Commerce as an avenue towards greater collaboration and building strength in developing regional teams with connections throughout Arizona. In 2014, the organization built affiliated chambers in Sierra Vista, Douglas and Nogales to reach out to constituents and provide them a strong business voice. Collaboration is vital and the chamber’s advocacy voice is important in the military sector ($5 billion economic impact), while assisting in securing better paying jobs and helping maintain a healthy economic environment (supporting tax reform). A perfect example of the impact of the chamber’s efforts is the growth of the affiliated chamber in Sierra Vista that has recently exceeded 120 members. Likewise, this year, the Mega Regional event, SonoraFest 2018, will be held at the Mall of Sierra Vista, June 15 and 16. Last year the SonoraFest attracted about 3,000 attendees in Bisbee and this year the attendance is expected to be over 4,000 visitors to interact with the businesses represented from Sonora, Mexico. Included in the meeting activities, Mr. Gary Trejo of Grasshopper Landscaping and Maintenance Company and Ms. Sheila Foraker, District Executive for the Boy Scouts of America, Catalina Council, became the newest members of the Rotary Club. Both were inducted into the club by Club President Nancy Fusco who challenged them to seek opportunities to demonstrate their commitment to Service Above Self. 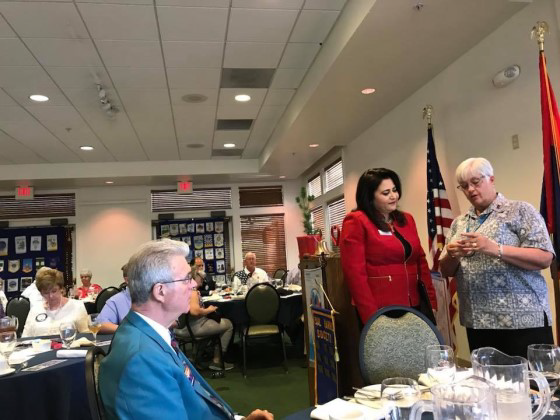 Club President Fusco reminded the club members about the club trip on April 14th to the Aqua Prieta Rotary Club of Sonora, Mexico that will be a chance for fellowship with our Mexican partners. The club also has an event at Vinny’s New York Pizza on April 16th for support of the Buena High School Project Graduation. In another action, Rotarian Les Orchekowsky has created a "Plant a Tree" project to support Rotary International President Ian Riseley’s goal to have every Rotary club member worldwide, plant one tree in this Rotary year, 2017-18. Les will work with club members and the Huachuca Hospitality House (HHH), a retreat for active duty military, to plant trees locally at the homeowners’ or the HHH.